When Inna Dombrovskaya, who is a great cat lover, saw this peculiar feline called caracat, she totally fell in love with it and set her heart on getting one for herself, even at the cost of her car! 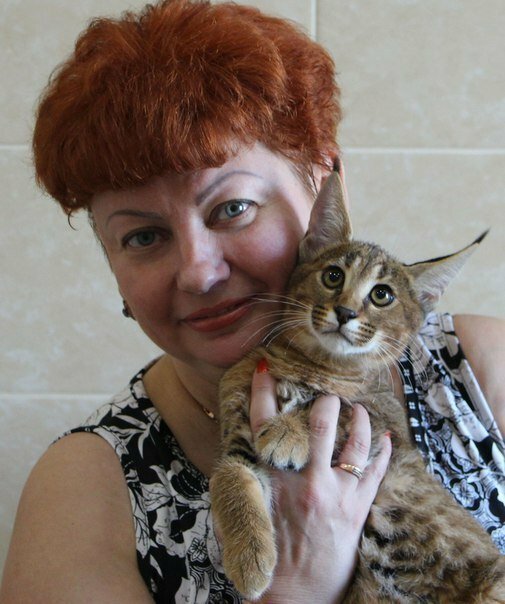 Regina Konstantinova — No doubt, a caracat looks like a million rubles, but it also costs this much too (US $15,363), making caracats the most expensive breed in the world, felinologist from the Siberian city of Barnaul and happy owner of an exotic kitty Inna Dombrovskaya reveled in an interview to Sputnik International. "The caracat is a new kind of cat, which is extremely difficult to breed. 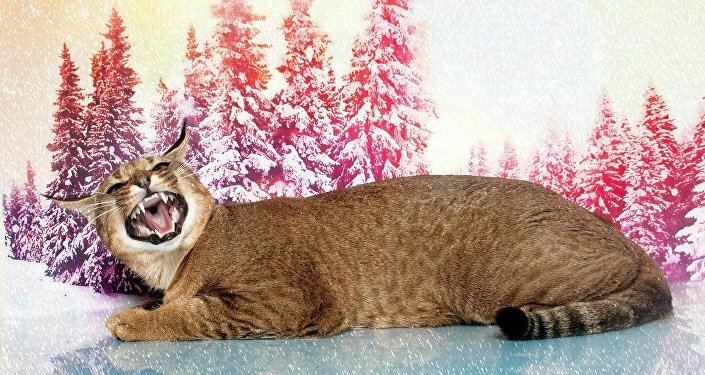 It is a hybrid of a caracal — a lynx-like wild cat — and a domestic cat. By now, there are only 25 caracat in the world," Inna explained. "These cats grow up to be the size of a large dog; they inherit the habits and appearance from their wild carnivore father but remain as friendly, tender and playful as their domestic mother." "Throughout 23 years, I've kept a lot of various felines. But a year ago when I saw the caracats, I was absolutely amazed by their beauty!" said Inna, who is an international expert in all cat breeds. In order to pay for such an expensive pet, the woman had to come up with a tough decision: to sell or not to sell her car. "My husband told me: ‘If you want a kitty that bad, then sell the car!' He was sure that I would never do that. Of course, I was sorry to sell it, but I was even more desperate to have the cat of my dreams. And now my husband loves our gentle kitty more than anything else!" Inna said. "Funny fact: the car was a Toyota Prius, which is a hybrid, too," she added. 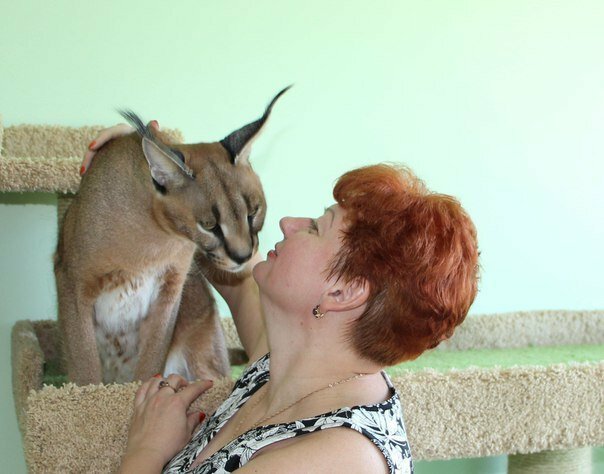 Caracal, Ginny the caracat's "father"
According to Inna, there's only one place in the world, where you can get a caracat — it is a cat breeding compound Kataleya located in the Russian city of Krasnodar. Kataleya Ginevra of Prestige, or simply Ginny the caracat, is just 9 months old, but already has two "grooms," the cat's owner said. "Caracats are just hybrid animals, but I would like to develop a proper breed. For the time being, Ginny and her future ‘partners' are still growing up; but sometime later I hope my princess will bring us beautiful kittens," Inna said. 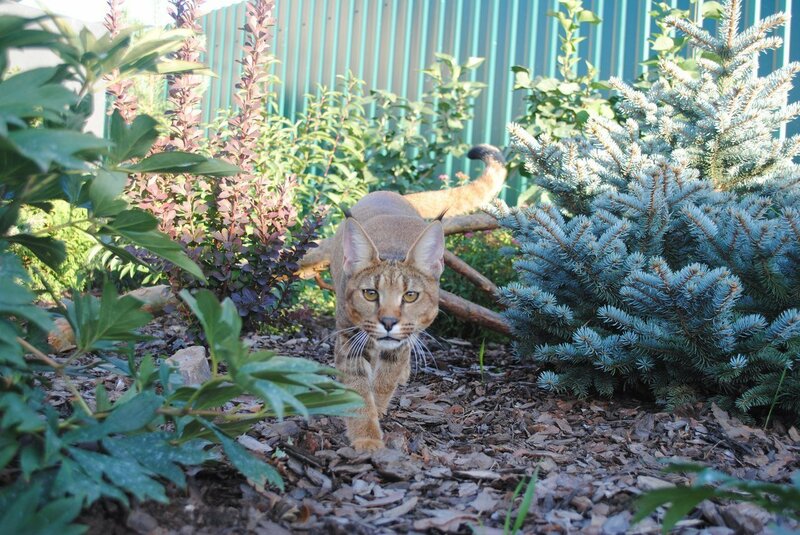 The luxury pet's owner also revealed that her little "domestic lynx" already weighs 9 kilos and follows a high-protein diet: the exotic cat eats nothing but chicken, rabbit and quail meat. Ginny the caracat is not the only pet at Inna's home: "We also have another cat and a dog. All three of them love each other very much!" Ginny truly enjoys the company of her fluffy puppy-friend Chusya. 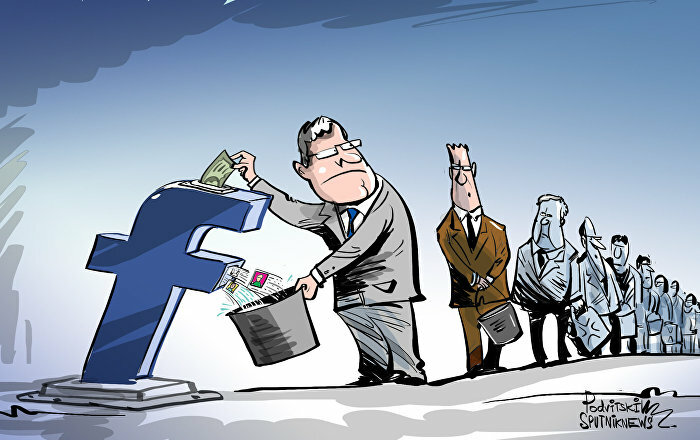 Каракет Каталея Джиневра оф Престиж и ее любимая подружка!